One of my laptops is getting old and the lid is not as sturdy as it used to be. It now has the unwanted tendency of triggering a “laptop lid open” event when you barely touch it because the lid moves up a bit and back down. This is problematic because it wakes up the operating system, which doesn’t always detect that the lid was closed immediately. When you run an internet search about laptop lids and putting Windows on stand by or hibernate, you find a lot of stuff, but nothing useful about disabling resume. To solve this problem you need to think like a programmer, i.e. find a solution that kinda makes sense, but not really. Obviously, the answer lies in the Power Options dialog, but the only setting you have access to is what to do when the lid is closed, not when it is open. Well, here comes the shocking answer: if you put your computer on stand by when you close your lid, it will wake up when you open it. But if you don’t do anything when you close your lid, it won’t do anything either when you open it! Setting that first combobox above to “Do nothing” therefore fixed my problem. 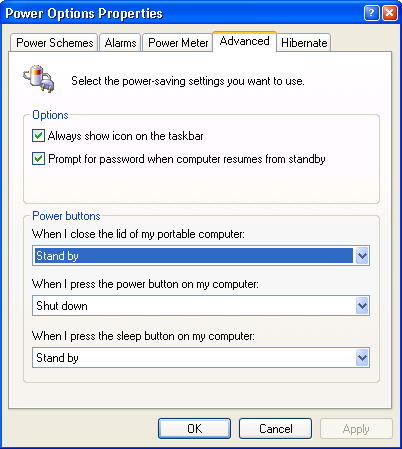 Now, I can close the lid, let the computer go to sleep after 5 minutes of inactivity, and move it around without fear of it waking up because the lid is too sensitive. I do have to press the power button to wake it up instead of just opening it, but that’s not too awful.